The challenge is to replace the bridge plate on the highway in just 1 night and should be able to pass the vehicle in the morning. This road is the main road leading to Soekarno Hatta International Airport. 1. Localize the area to be repaired with traffic signs fitted. 2. Work begins promptly at 9 pm. 3. Asphalt and concrete surfaces that will be replaced with a concrete cutter cut. 4. Then peeled asphalt with jack hammer that uses power the compressor. 5. Similarly, the bridge concrete plate was demolish with a jack hammer which powered by air compressor. 6. To the small chunks of concrete, especially on the corners used electric powered jack hammer. 7. After the concrete edges trimmed and cleaned it in-Assemble formwork hanging. This is because the water flows under the bridge and not possible heavy poles fitted. 8. The rusted steel reinforcement cut and then tied with wire replaced. 9. Bonding agent (Nitobond AR) was applied to the connection plan of the new concrete and old concrete with a brush. 10. The first rapid setting mortar mortar (Patchroc RSP) made somewhat thick (minimum dose of water) to cover the gap between the existing concrete formwork. 11. The next mortar made with a normal dose according to the instructions on the product data sheet. 12. Promptly at 3 am casting job done. 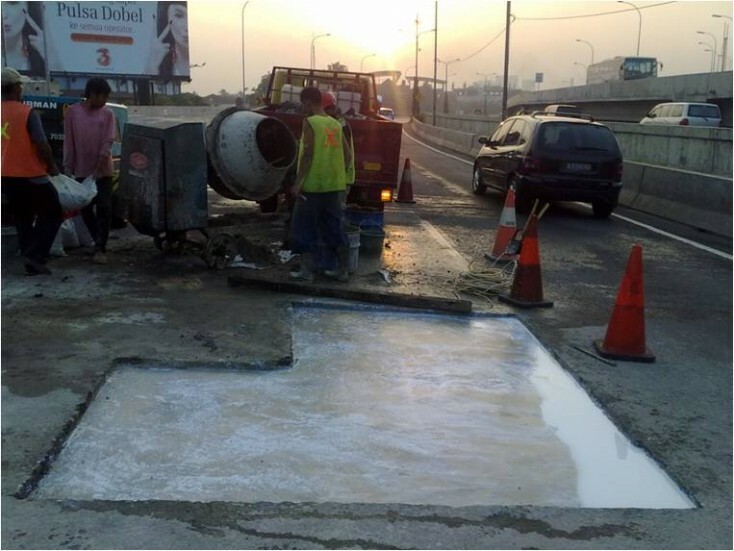 Using a bonding material curing agent (Nitobond AR) were diluted with water and then flooded above the concrete surface. 13. One hour after the concrete surface covered and compacted asphalt. 14. 5 am traffic was reopened.